Monsters have never been so small! 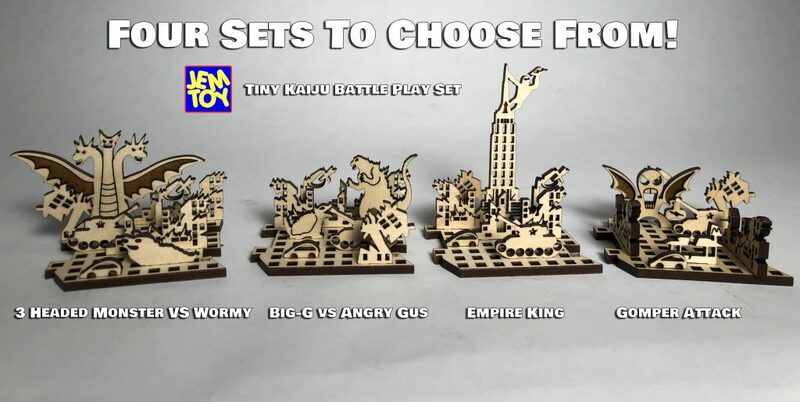 The JEMTOY Tiny Kaiju Battle Play Set fits in your hand. Very small parts intended for collectors age 15 and older. Four different sets to choose from – amazing gift, available now in my etsy shop. 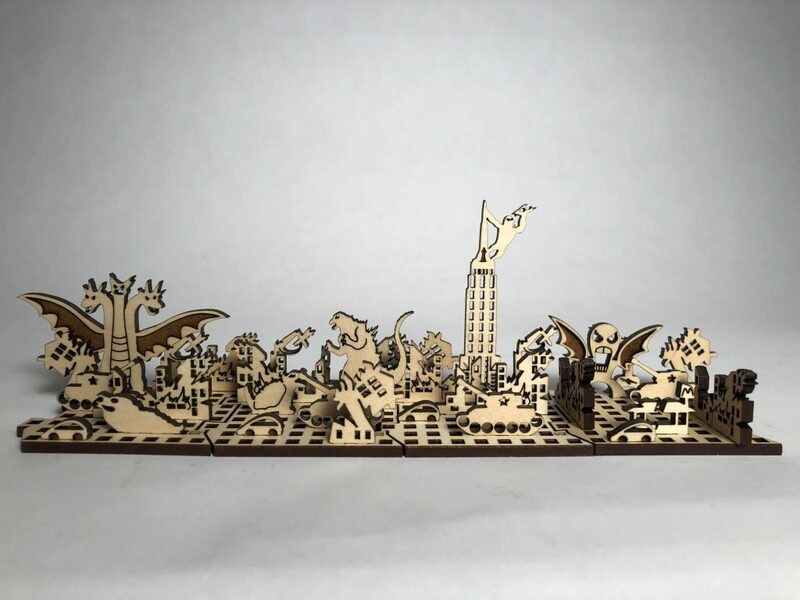 Platforms are small, about 2″ x 2″ and they fit together like a puzzle, so if you collect them all, you can mix and match your pieces for the ultimate Tiny Kaiju Battle! It’s been a while since I’ve made a horrible Gomper, so they’re back with a mighty vengeance. 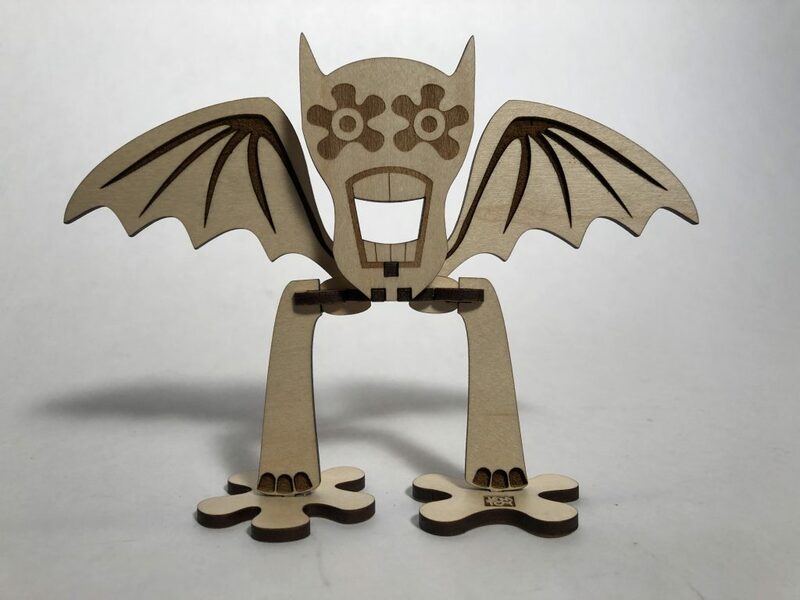 Laser cut plywood kaiju monster. He stands 4.5″ tall, and the wings are 6.5″ wide. I really enjoyed making this fine fella. The build gave me a few new ideas, and that’s what a prototype is for. Thank you horrible Gomper. This Gomper is stomping around my etsy shop. 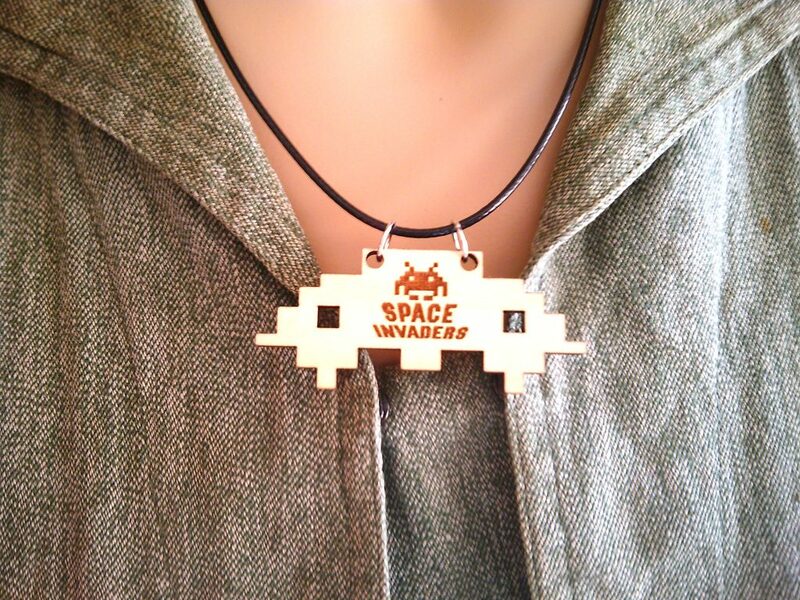 My wife is a big fan of Space Invaders. Our love for science fiction, fantasy movies, and video games has made my geeky life a very happy place. Here is a nerd’s dream come true. A large 2″ wide Mother Ship with an Alien logo laser etched on front. 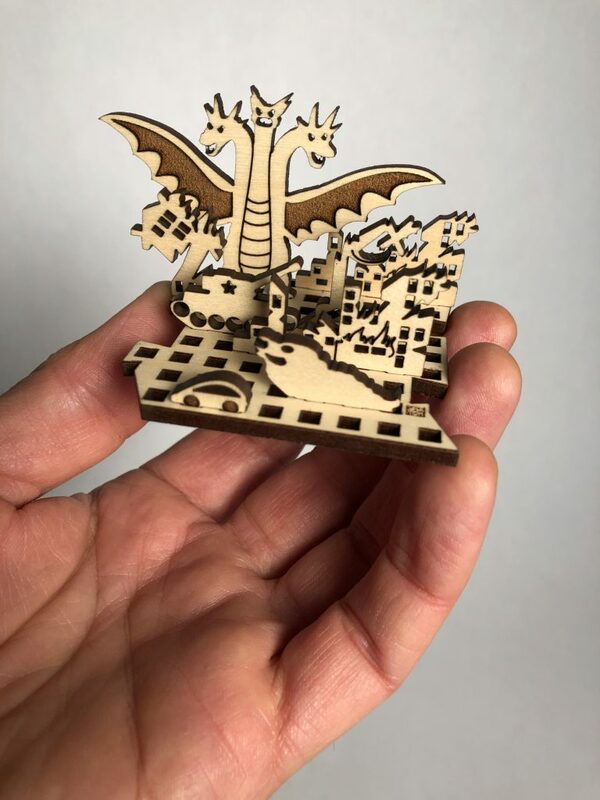 Made from proof grade maple plywood, cut and etched in HD on a Glowforge laser cutter. Item ships fast via USPS Priority Mail. 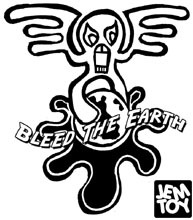 Wear this over a black tee shirt, and you’re ready for any cosplay or comic convention. Atari Space Invaders is a pop icon that stands for the entire gaming community. Be counted among the invaded. 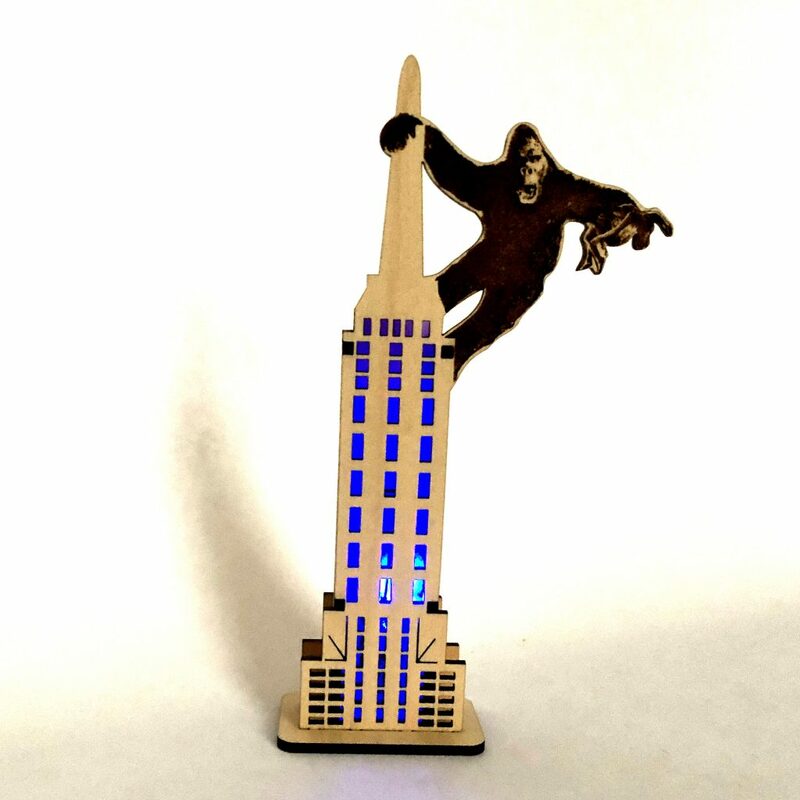 You can get one for the geek on your holiday list at my etsy shop below. Thanks, and have a great holiday! I have always been fascinated by how simple homopolar motors are. Kids are blown away by the immediate fun. But not just kids, everyone wants to check it out. Made only of a battery, a magnet, and copper wire, this simple motor can get really hot. It’s hard to play with them without forgetting and grabbing the hot wire or battery by mistake. I wondered if I could build little light weight wood structures to make them more finger safe. Getting the perfect wire shape can also be tricky, so I have to consider balance and stability, and of course see how fast I could get it to spin. 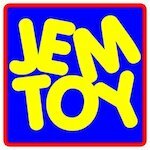 I’m really psyched about what I have cooked up in the JEMTOY studio, because these things can really spin. 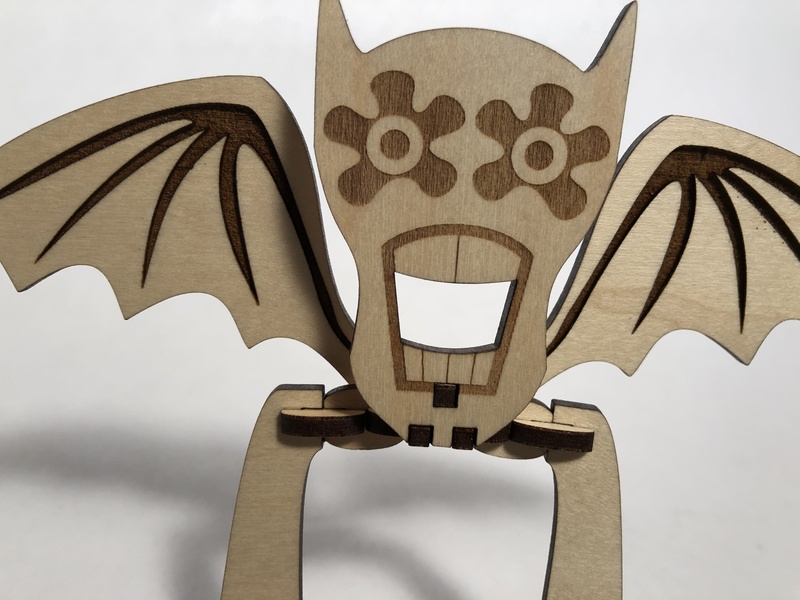 The design is laser cut from 1/4″ maple plywood, and is easy enough for anyone to put together. Here is a video of me assembling the JEMTOY Homopolar Motor Kit so you can see how crazy cool it is. I mean, for science, that is. YOU SUPPLY GLUE AND AA BATTERIES!!! OH NO! MORE SCIENCE! The nut and bolt in this kit are made of brass, not steel like most nuts and bolts. Steel is ferrous, which means it contains iron. Iron is magnetic, and a steel bolt would snap tight to the magnet, and then, the homopolar motor would not spin. The brass bolt is nonferrous, so it does not stick in place to the magnetized battery top. So much to think about for such a simple device, right? Let battery and magnet cool before touching it. Flip the magnet – sometimes it spins faster the other way! Use a fresh AA battery – remember it gets HOTTER the longer it spins!!! Glue the wood pieces together – white glue or super glue will work. Adjust wires on bottom to touch magnet loosely – not too tight. Don’t forget it spinning too long – battery gets hot! Parental guidance suggested for the wee ones – battery gets HOT I tell you. Kids like that it’s slightly dangerous because kids like to be challenged. Every second you play with this homopolar motor kit, you will be learning, thinking, wondering, and expanding your understanding of the universe. For reals. It’s that cool. Great rainy day project to keep them busy for hours, or an amazing way to share the wonders of magnets and electricity with your students. Just keep them informed about how hot the battery gets, and let them have at it. Perfect project for science fairs, S.T.E.A.M. projects, maker faire booth. Kids have fun learning engineering, design, and the basics of how an electric motor works. Google and Wikipedia have all the scientific explanations if you want to search the term homopolar motor. No matter how many times I read that stuff, I have to admit, it just looks like magic to me, so that’s another thing I love about it. I think the darn thing is magic! The first wave of mini UFOs invaded our earth unmanned, controlled remotely by an invisible force from outer space. Who could it be? Men from Mars? Women from Venus? The Tralfamadorians? It soon became clear with the arrival of the second wave, little starships piloted by aliens. See their clear cut faces ominously catch the changing color light glowing inside the pod. Let’s just hope these little guys come in peace. Choose from several versions of UFO Flying Saucers up in my etsy shop. 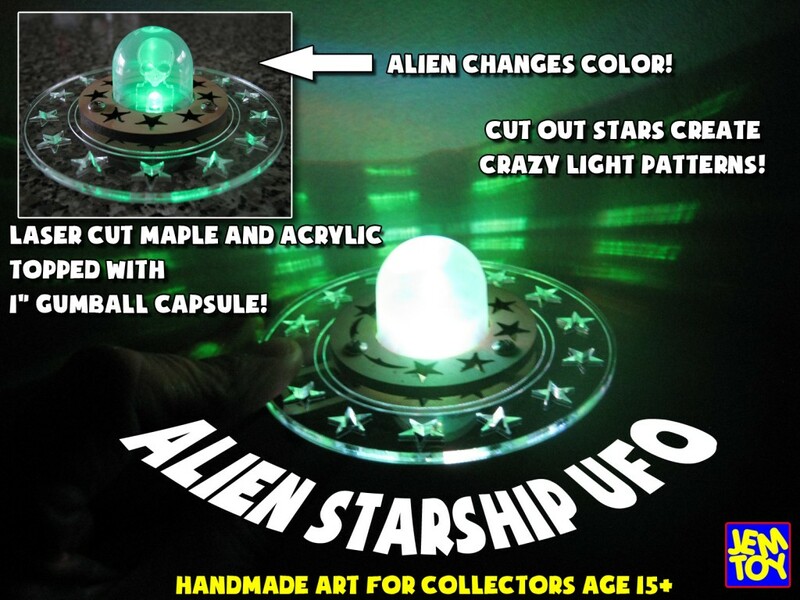 I have been having a blast designing these little UFO flying saucer lamps. When I was a kid, back in the early 70’s, I was out with my mom shopping, and I saw a display of UFO toys I was curious about. They looked as if they were made for girls. Cute little girly aliens inside classic flying saucers. Made from turquoise, pink, and purple candy clear plastics with glitter embedded. The little Alien gals inside the UFOs were really cute. I didn’t care if they were girl toys or not, I wanted them. Mom was way too busy that day, and we had to go. Sad thing is, I have never seen those toys ever again. I still wonder what they were called. 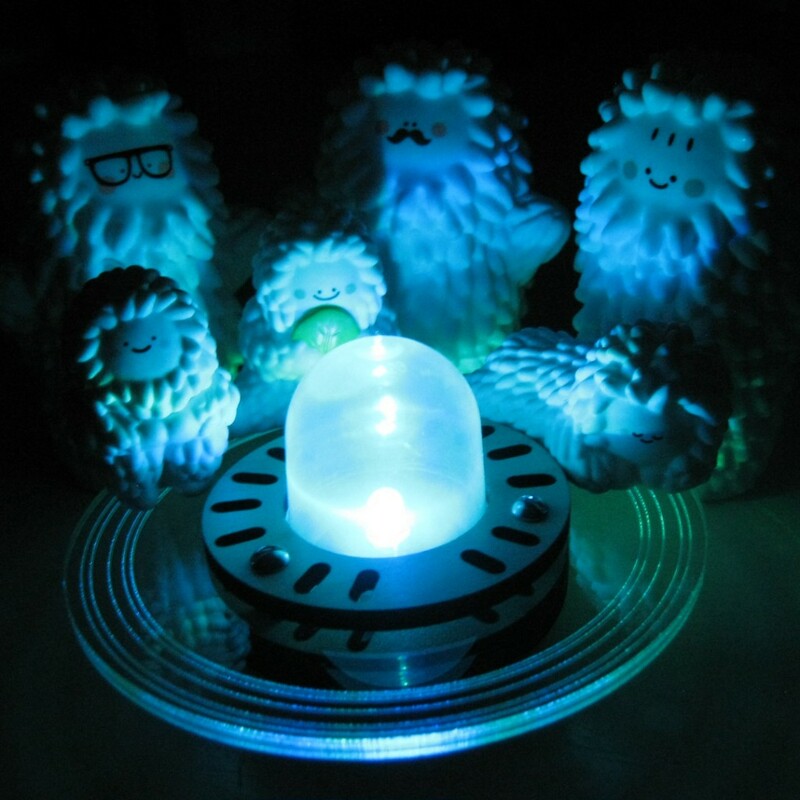 Instead, I thought I’d make my own batch of tiny UFO flying saucers using the little pod capsule from gumball machines. I showed my first UFO to my wife, and she looked for a way to turn on the light, but I had not included one. I took that as a challenge to be sure the next one did light up. Now, I’m making several UFO variations. The Starship has little star cutaways in the maple ply and acrylic ring. The cut out stars create visible lines of light along the wall, as the LED sends a nebula light show to the ceiling. Check out the video above to see it in action. 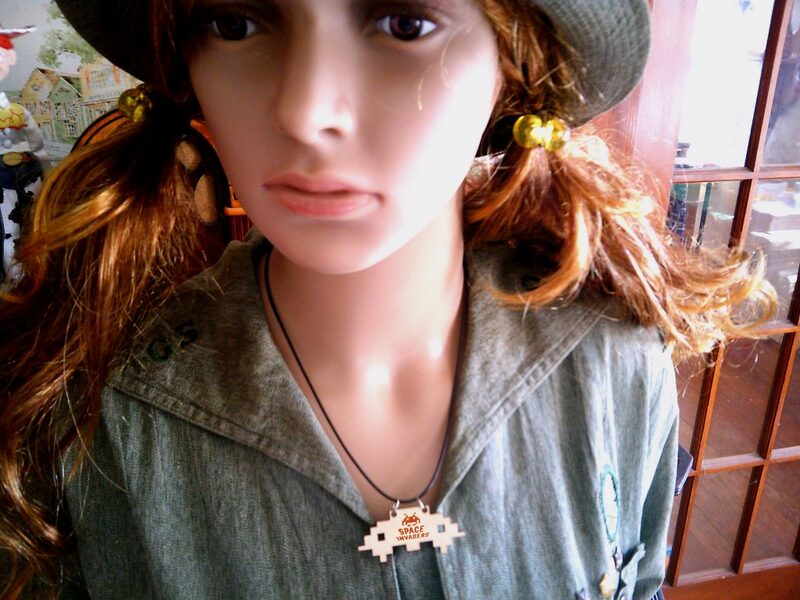 JEMTOY UFOs ship USPS Priority Mail, with a 2032 coin cell battery so it’s ready right from the box. Several UFO styles to choose from. Check ’em out before they all blast away! I have a thing for kitschy B movies. The classic flying saucer is one of my favorite blasts from the past. For a long time I have wanted to turn gum ball machine pods into a UFO, and I’ve finally done it. The acrylic sends out bands of colored stripes as the top emits a nebula of changing color. 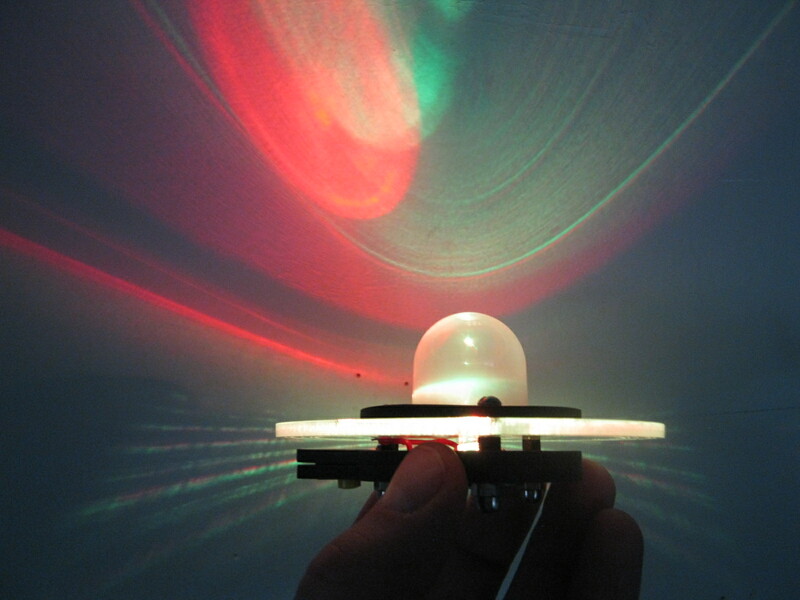 This small 3 inch lamp can easily turn your room into a galaxy of amazing light patterns and colors. Although I try, the video cannot do it justice. You must see it in person for full effect. Surprise your friends, create the perfect mood, kick back and chill. Check it out! Information and ordering links below.